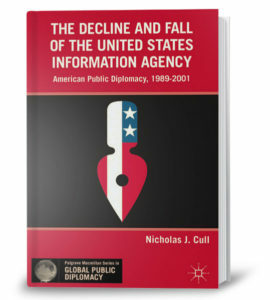 N Nicholas Cull’s new book The Decline and Fall of the United States Information Agency: American Public Diplomacy, 1989-2001 is the second and final volume in his comprehensive history of the United States Information Agency (USIA), the independent foreign affairs agency within the executive branch of the U.S. government charged with the conduct of public diplomacy (PD) from 1953 to 1999. The first volume traces the Agency from its post-World War II birthing pains to what many perceive to be its high-water mark in 1989 when, in December of that year, Mikhail Gorbachev and George H. W. Bush declared the Cold War over at the Malta Summit. The current volume tracks the Agency’s decline in the subsequent decade, culminating in its consolidation into the State Department in October, 1999. Decline and Fall is a well-researched work, marked by lively writing and a keen eye for irony. Cull does not pull his punches in assessing the impact (decidedly negative) on U.S. public diplomacy of USIA’s forced march into oblivion, and his analysis of the very American reasons behind this curious chapter in U.S. diplomatic history is particularly insightful. Scroll down to read the preview version. Cull has chosen a top-down approach as his organizing principle for the book. The chapters align with a Presidential administration and focus on the individuals chosen by the President to head the Agency. While somewhat limiting, this is probably a wise choice for two reasons. First, much of the success or failure of USIA over the course of its history depended to a considerable degree on the relationship of its Director with the President, National Security Advisor, and Secretary of State, as well as on the Director’s individual capacity to lead and maneuver in a very politicized space. In fact, as the decade of the 90s wore on, it seemed increasingly apparent that the fate of USIA was being decided, not on the basis of its value to the nation, but as a piece to be traded in a high-stakes game of political chess. It was USIA’s misfortune, Cull writes, that at a time when USIA needed its political leadership to be at its strongest, it was instead at its weakest. Second, trying to capture the scope and scale of the programmatic activities of an Agency with missions spread over scores of countries and cultures around the world, each headed by different leaders with varied interests and talents, would only have served to bog the book down in needless detail. That said, Cull tries to balance tales of bureaucratic skirmishing among the leadership in Washington with selected descriptions of how USIA worked abroad in support of various high-profile policy initiatives (promoting democracy in the former republics of the Soviet Union, explaining U.S. actions in the first Gulf War, mobilizing public opinion in support of American policies in Haiti, the Balkans, Iraq, and other hot spots). To capture this part of Agency life, he highlights to good effect the work and careers of a number of individual USIA field officers. Framing Cull’s description of the last decade of the Agency’s life is the concept of the journey, of which he identifies four: the Road to 1999, which traces the path to consolidation; the Road from 1953, which examines how well USIA fulfilled Cull’s five elements of PD – Listening, Advocacy, Cultural Programming, Exchanges, and Broadcasting (with broadcasting faring best, and cultural diplomacy the worst); the Road from 1989, which assesses how the Agency met the demands of the “New PD” (surprisingly well, Cull finds); and the Road to 9/11, where the author looks at how USIA’s story may inform discussion of the possible causes of the 9/11 tragedy (Cull concludes that “USIA could not have averted 9/11, but the agency could have helped on 9/12”). 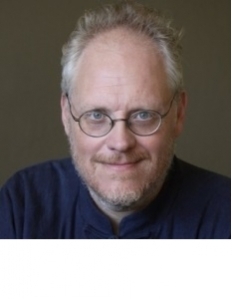 Discussion of these “journeys“ appears largely in the prologue and conclusion, and it is in these two chapters that the author’s passion for his topic most clearly emerges, and where his analysis of what USIA’s fate reveals about a broader American attitude and approach to PD is at its sharpest. Cull attributes the Agency’s demise to a number of factors – its inability to define itself as other than a relic of the Cold War; weakness at the top; the lack of an adequate domestic constituency; and an underestimation of the skill set necessary to be an effective PD practitioner. (To these, I would add USIA’s failure to establish a professional evaluation regime capable of demonstrating PD’s effectiveness in supporting U.S. national interests, and chronic under-funding, the latter no doubt partly a result of the former). The key factor, however, according to Cull, can be found in American political culture itself, a culture that feared government communication efforts, especially in peacetime, and favored the pre-eminent role of the private sector in the information and cultural realm. Given this mindset, USIA always seemed to be an easy mark for budget cutters and ideologues of all stripes, more honored in word than deed. One indicator of the Agency’s tenuous position within the American political fabric and of doubts about PD in general lies in the sheer volume of commissions, committees, study groups, and blue ribbon panels set up to review and improve it, a phenomenon that continues to this day. Has any function of the U.S. government ever been so regularly and intensively studied over the last 50 years as public diplomacy? In Cull’s discussion of the “tragedy” of American PD, that is, what was lost as a result of the Agency’s decline and abolition, he is careful to separate form from content, recognizing that, ultimately, the question is not whether there should be a United States Information Agency (in fact, on that point, Cull is agnostic but suggests that, if a separate agency were to be re-created, the cultural function should be privatized), but whether the American polity will come to recognize the contribution that public diplomacy can make to U.S. foreign policy and to strengthening America’s image around the world and support it accordingly. USIA may not have been the perfect instrument, he says, but the heedless and short-sighted way in which it was gutted, then abolished and absorbed into the State Department (with its component parts scattered throughout different Bureaus and the Under Secretary left with no direct line authority over many of its personnel) did significant long-term damage to the “function” of U.S. public diplomacy. As for that keen eye for irony, Cull highlights a number of telling incongruities in USIA’s story: an organization whose raison d’etre was mobilizing public opinion failing to do so in its own defense when its very existence was at stake; a President, under whose administration the budget for cultural programs fell by more than a third, hosting a major conference on cultural diplomacy at the very end of his term in November, 2000, at which he extolled the value of mutuality and listening; an Agency tasked with promoting women’s rights abroad being successfully sued at home for gender discrimination; and to these I might add the spouse of the President under whose administration public diplomacy was shattered is now being charged, as Secretary of State, with putting it back together again. 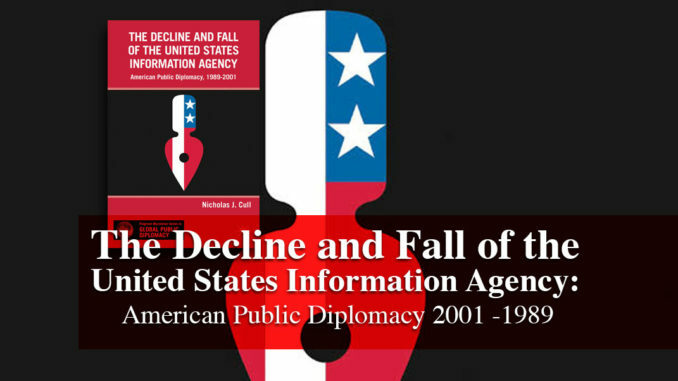 Share the post "The Decline and Fall of the United States Information Agency (Book Review)"